On Saturday the 16th of February 2013, a water-tanker reportedly went through an FC Check post situated on Kirani Road Quetta, Pakistan. After nearly 600 meters, the driver took a sharp right turn and entered into a heavily populated Hazara Town and detonated the water-tanker around 5:30pm (Pakistan time). A thick, noxious cloud rose into the air with an immense deafening sound, smashing nearby windowpanes, injuring mostly women. Upon hearing the blast, ghettoized Hazaras rushed to the scene where they unearthed the four markets adjacent to Kirani road along with an English Language Centre and a private school burnt to the ground. The ferocious fires, alongside the corpses of women and children was a scene that the survivors endured with excruciating difficulty. When the dust settled, limbs could be seen strewn across the scene. The panic and helpless hysteria of the victims was making the situation far more difficult to confront. Referring to the horrifying scene, Nayal a local journalist termed Saturday’s terrorist attack an ongoing “systematic extermination of Hazaras” that has continued for the past 12 years in Pakistan. Initially, 84 Hazaras were reported to have been killed; but local journalists are now reporting that 27 more Hazaras have allegedly disappeared due to the explosion. He also added that 17 amongst them were students under the age of 16 who were at school when the attack took place. Reportedly, the 1000 kilograms of explosives had thoroughly levelled the four double-story markets, along with the English Language Centre and a private school. The demolished walls, windows and doors of approximately 300 shops and 30 houses further added the overall accumulated damage. After the January 10, 2013 blast, Kirani Road was put on high security alert as it is the only road which leads to Hazara Town. Everyone, including the Hazaras would have to go through scrutiny by the FC personnel to enter Hazara Town. He raised a question asking how a water-tanker laden with 1000 kilograms of explosives went undetected by the FC check post on Kirani Road, which killed a 100 innocent Hazara Shia and injured 200, permanently disabling most of them, a mystery that needs to be resolved as quickly as possible by higher authorities. As usual, the banned Lashkar-e-Jhangvi (LeJ) accepted responsibility for Saturday’s deadly bomb blast in Quetta and vowed to continue its anti-Shia operations despite the governor’s rule or even if the military takes control of Balochistan. Earlier, on the 11th of January 2013, Lashkar-e-Jhangvi, in its press statement warned the Hazaras of more attacks saying: “God willing now the LeJ will conduct similar attacks in 2013. The enemies [Hazaras] will not find ways to leave Balochistan [alive]”. Law enforcement agencies despite knowing the threat posed by LeJ to the lives of Hazaras, did not make special security arrangements to avoid the many fatalities and innumerable injuries and left the terrorists to exercise full impunity and commit this massacre. 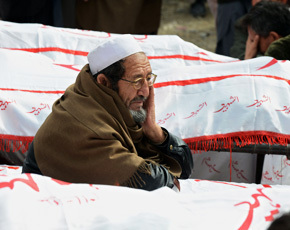 It is saddening to say that the Hazaras, after every blast, rush to the killing site, collect their dead bodies, most of the time in pieces, wash them carefully, put them in a clean shroud, bring their dead to the road and start a peaceful protest for justice, to let the civilized world hear of the horrible life they have faced for the last 12 years. While on the other hand, world leaders, including Ban Ki-moon despite being aware of the stark situation had clichéd condemnations read out by their spokespeople. Very few media representatives take the issue seriously, the majority of the print and electronic media despite knowing about the depth of the issue, don’t seem ready to bring all those involved in the terrorist activities to light and anchors seem to be milking the strife of the nation simply to have something to discuss on the television. Except for a few members of the civil society who genuinely feel responsible and take to the streets, holding up placards, depicting demands and slogans in favour of the victims, they make speeches, chant slogans and express their genuine solidarity with the victims; however the majority don’t bother. In the meantime, political parties stick to their condemnation statements to express their solidarity with the victims’ families just to maintain their presence on the media. Human rights organisations’ strong words to the incumbent government seem genuinely to express their concern but what can they do except issue statements. Social media networks such as Facebook, YouTube and Twitter fill up with the shocking news and videos to make the elite class and world leaders know about the persecutions of the Hazaras in Pakistan but these measures seem impotent and inefficient towards a pragmatic solution. After 12 years, over 1100 Hazaras have been brutally killed and over 3500 injured. Just within the last 40 days, over 200 Hazaras have been killed and over 300 injured. Despite writing, reading and watching very closely their persecution in Pakistan, I’m not pessimist but just curious as to how long the international community will keep passively watching the Hazaras collect their dead bodies. The writer is a freelance journalist and human rights activist based in UK. He can be reached at toyounasat@yahoo.co.uk. Islam has never been practiced as a religion of peace. Its only on paper that it Islam is a religion of peace. Anything that is born of hatred is cursed to live in hatred. May be Pakistan should examine all the things that went in its psyche since independance and should examine the things they need to rectify. After all experience is the best teacher. The silent majority should openly debate the issue and vote for what is right. If their vote is based on hatred, so will their nation. I will like nothing more than see Jinnah's dream come true of a peaceful progressive Pakistan. Nonsense. In five years time we will send all the Shias to the Moon. Ask our beloved Ziad Hamid. Take out the thorn with other thorn. Mr. Zardari goes out after spending 5 years in the bunker in Islamabad. Legacy of breakdown of law & order during his tenure will live for ever. An ethnic minority,Hazaras had to bear the brunt of mindless violence & sectarian killing. Sad as it is, legislative branch of the government treated massacre as a turkey shoot, so did we as a nation. Pakistani state is negligent in protecting Shias, Ahmadis, Christians, Hindus and women, all of whom are its citizens. At a minimum Pakistan should be reported to UN, OIC and other international organizations and condemned for its criminal negligence. Can anyone in Pakistan tell us why the Hazaras are being singled out .If its because of their Shia belief why does Iran turn a blind eye to their plight ? Your reflexion is not well placed. Please document yourself more about Syrian conflict. What are you and your big hearted Imran Khan doing? Blame the thugs you are sponsoring for the deaths in Kashmir. When did China ever speak up for human rights? You all weather friend is only interested in satisfying your political and military leaders. As far as I recall the Taliban came after the US had left Afghanistan. For Allah's sake its not Hazara Community but Pakistani Shia Community. Why is the media trying to portray it as its a Hazara issue & not Systematic Cleansing of Shias? The killings will go on till Hazaras are there in Pakistan or Iran intervenes and carves out a territory for them! Think what an LEJ mind sees, a bunch of shias who dont even look like pakistanis but are mongoloid. Fair game for killing and the great part is they dont retaliate, they just protest. Time is not far when they will start bombing the mourners too for having the temerity to protest. Its like the killings in Rwanda. And all this can be put at the feet of General Zia who preached hate to stay in power, so now all are fair game be it Shias, Ahmadiyas, Christian etc. I feel shame to get help from anyone within or outside Pakistan, because all is the same (ek Thali k Bengon). I am prepared for anything, because I cannot do anything for myself then why to beg in front of the world. Tribals that are pro military (or pro Pakistani) in FATA region are maximum shias. They are being inducted in army to fight talibans. This all is in connection to that. Pakistanis love to hate the UN, the human rights groups, the foreigners, except when it is their turn to be victimized - then all of a sudden they want the human right groups to speak out, the hated foreigners to support them, and to protest, etc. Perhaps the international community expects Pakistan with its sophisticated army and intelligence services should protect its citizens. Hazara revenge is the only answer to these Lashkar Jhangvi barbarians and animals. Kill or get killed. If the international community inter fears you people will come around saying crusaders, the great Satan etc. Frankly no come can help Pakistan except the Pakistanis. Try to instill this spirit in Pakistan rather than blaming the international community of negligence or over looking. This is the typical Pakistani mindset. Where is our savior Imran Khan? He is probably negotiating with the killers. Lej and banned outfits are already assuming that Iran is behind all Shias of Pakistan which is 110% wrong. With a single word from Iran it will be easy to confirm the already established theory. The question is why Saudia Arabia is not condemning these brutal killings ?? Plz be informed that there is no difference in the killings of Hazaras and Shias of other part of the country both are being killed due to their affiliation with Shia Sect. Hazaras are soft target due to their traditional looks and distinct populations in tribal areas & Quetta. How long will Pakistan remain lawless, bigoted, and barbaric? Pakistan is a brainwashed nation, plain and simple. Our leaders are busy safeguarding the seats, but never looked at 12 year old atrocities against Hazara community. my deepest sympathies to this grieved Hazara community may Allah give them the strength to bear this irreparable losses. A peaceful protest is a slap on leaders and terrorists faces. Allah is with you and the prayers of all mankind in this world. You will succeeded, Inshallah. Allah o Akbar. If hate, hate and more hate is all the nation can offer to its citizens, then the state is not worth having. Mr. Jinnah was a khoja shia. yes. Not that that has any relevance to what is happening in his country today. How ironic....comments after comments on Shia killings but no one wants to touch Hazara killings!!! Hazaras and other minorities need to be moved out of pakistan. Pakistan is for 100% pure sunnis. It is more than obvious that Pakistani Government has no desire or will to stop the killers and haters like LEJ. It is up to the International Community of Nations to take action and make it unbearably painful for the Pakistani Government to be a complicit agent by it's inactivity by imposing severest sanctions and embargoes on it. Time is well past issuing condemnations against these murderers and sympathy for the victims. Need is for action. was Mr. Jinnah a shia? That is because of religious teaching.All killers are booking their berth in heaven by doing a "noble act". Pathanoo bhai!! khud bhi hum kuch kerlien !! This help from International Community has gotten us to where we are today. Why cannot this nation wake-up? Is it more important to have nuclear weapons, have thousands in the army, but cannot even bother to safe guard its own people. Dear author first answer me who is "international Community" ? ohhhh!! do you mean our brothers in Gulf who generoulsy support these banned outfits both financially & morally?? or may be US, who created Taliban at the first place to win their proxy war against Soviets? Or the UN; the organization busy in obeying the commands of US, Uk, Germany & France. There is nointernational communtiy my friend, its quiet an absurd terminology that means literally nothing in reality. Let's not blame Zia for all the ills that plague Pakistan; let's start with Jinnah who founded this cursed country on the basis of hatred for the "other"; the other then being Hindus and Sikhs. Then came that great enlightened mind, Z.A. Bhutto who had the state declare a till then sect of Islam, to be heretics and non-Muslims via the Constitution. That mea amicus was the end of any hope there ever was for this country joining the comity of nations as a a civilized state. I second your opinion khan bhai !! right on. FC / Rangers / Military/bureaucracy/ politicians - all accomplices. This might be another way of justifying military take over. I wish hazara also start taking revenge ans kill people of other sect on day of jumma near any mosk. we need to follow our cult very precisely....let deal with these terrorist same way. The on going Hazara genocide is extremely condemnable and the government along with agencies have totally failed to tackle this terrorists .At one side this issue has killed a large number of people and so on the other hand the bad image of Pakistan has now changed to worse after massive protests all over the world . "who don't even look like Pakistanis"; what is a Pakistani supposed to look like? Is Pakistan a nation or a race? If international community is insensitive to plight of Kashmiris and Palestinians where 100s of thousands of people are killed during the last 65 years, I am pretty sure the heartless international community will watch for another 60 years. I am perplexed the Muslim world is silent about Shia killings. No significant govt. which has an influence on Pakistan has raised a question or offered support to Hazaras, Shias. Even China is silent. Even the US should all aid to Pakistan till they can stop all sectarian killings. It is the "most despicable, horrific act carried out by these so called humans on fellow humans" I can't imagine for a minute that these suicidal maniacs are in heaven, rather the opposite "burning in the lowest deepest fathoms of hell" The people are first and foremost "Pakistani First, and anything else after that" and if anyone has an issue with understanding that should be dealt with accordingly by the appropriate means available, with devastating effect for others to see the end result of their misdeeds in the name of "so called religious beliefs"
you sound more logical in just 3 lines. The Government of Pakistan needs to understand that the attacks on Shias as well as the lack of leadership in dealing with the radicalisation/extremism that is growing in Pakistan is being talked about in many nations. And Pakistanis if they wish Pakistan to survive as a nation need to address this with maturity and focus. Revenge is never a solution. I think shias are being targeted across the board to avenge killing and displacement of sunnis by Syrian shia government for the past two years. I fear we are going to be in this sectarian war for a long haul. Leaders enjoy in their palaces, while the innocent masses die on streets! Common man is scared to death. Why forget the millions of Bengals?